We got up early at our hotel in Akureyri – the Pétursborg in Hörgárbyggð (it is number 380 on the Icelandic Farmholidays Program). The owners’ two young daughters were up early, so there was a lot of noise in the basement making it very difficult to sleep in. We had a quick breakfast and headed out on Route 1 back towards Reykjavik. As Route 1 heads inland from the Eyjafjordur fjord (where Akureyri sits), it goes through a deep beautiful valley and then up over a pretty little mountain pass. There are numerous waterfalls throughout the valley. This drive was very reminiscent of the drive along the Southeast coast – not in topography, but in the fact that there were almost no cars on the road (both a function of how rural the area is and also the hour of the morning that we were on the road). Our first stop in the morning was the bustling service center of Varmahlid. With a town population of less than 100 people, there’s not much here other than the gas station complex. We grabbed a quick hot coffee and went across the road to the Tourist Information Center. You’d think in a town of 100, the Tourist Information Center wouldn’t offer much – you’d be wrong. This is a delightful little shack with free coffee, nice handcrafts and very informative staff. Laura was going to buy a sweater here, but they didn’t her size in the style she wanted (like most handmade crafts – you get what they have available). Just about 200 meters up the hill from the service station is the Vidimyrarkirja – a church dating from 1836, although a church has been on this site since the 1100s. 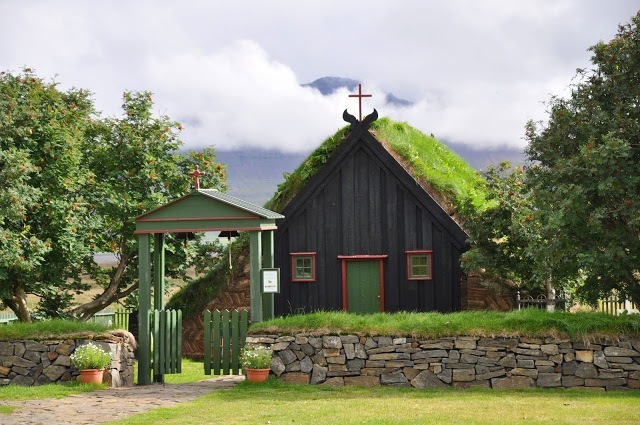 This is one of the most picturesque churches we saw in all of Iceland. 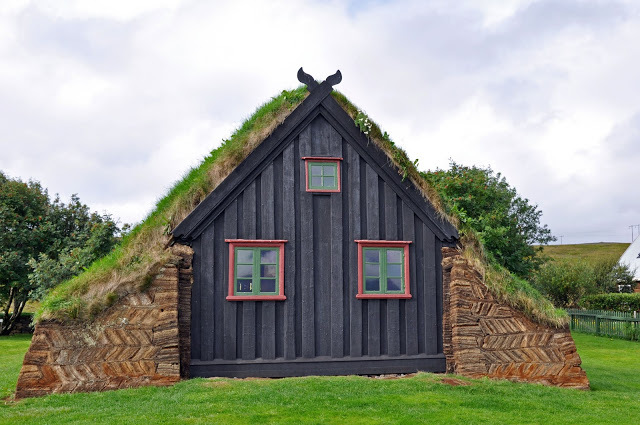 Its turf sides and roof are capped on both ends by wooden walls that are weathered to the point of being almost black. 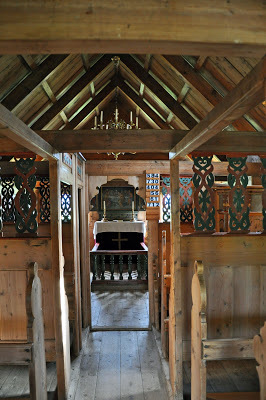 The National Museum of Iceland runs the church and charges a small admission to go in. We paid, but we saw others who didn’t (they just took pictures outside and left). 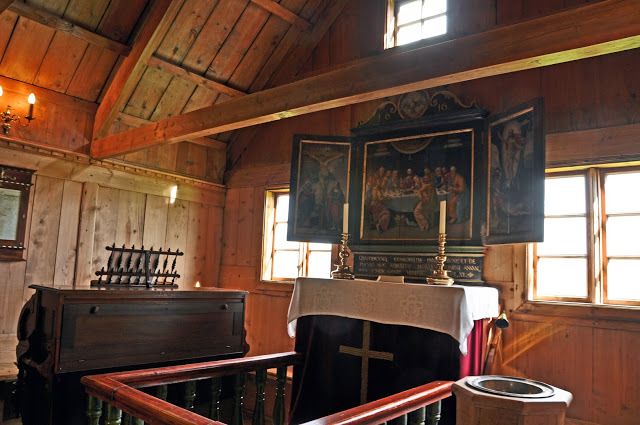 The inside of the church is rustic – pine wood walls with some painting and decorations, but mostly au natural). We continued on Route 1 to Blonduos, where we stopped for an early lunch. We had a quick hamburger (complete with paprika spiced sauce) at the N1. Then we headed about 20 meters down the road to the wild space-age looking church. Just past Blonduos, we took a small detour off Route 1 to visit the Pingeyrakirkja. This church, built in 1877, is noted as being one of the few Icelandlic stone churches and plays into one of the many Icelandic sagas (not sure which one). We found the church to be very photogenic from the outside and skipped going into the church (probably in large part to the huge tour bus that was there). We took a brief detour off the Ring Road to go into Hvammstangi. We had heard that there was a good wool shop in this town. We drove around and around looking for it (evidently, a large bush had grown over the sign on the way into town, so we missed it). We were really disappointed in this store. It was almost exactly like the store in Vik, but nothing was handmade. Hvammstangi was skippable. Back on Route 1, we made a detour at Bru/Melar taking 61 North to 59 East. This was a mistake. We found Route 59 East to be in terrible condition and it took a long time to make our way across the peninsula (we should have gone all the way along Route 1 and then backtracked by taking Route 60 North). 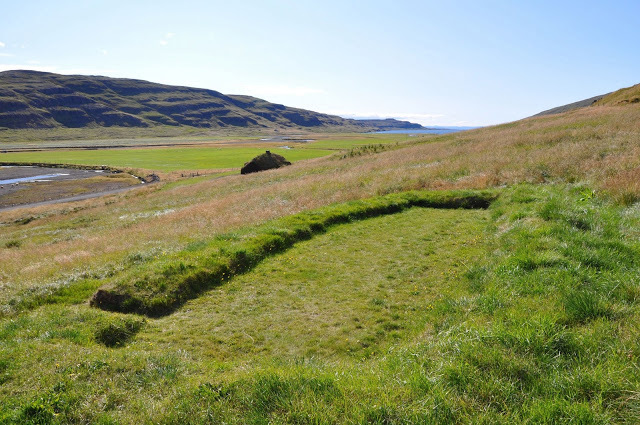 Our goal was Eiriksstadir – the original home of Erik the Red, father of Leifur Eiriksson. This was one of the highlights of our trip. 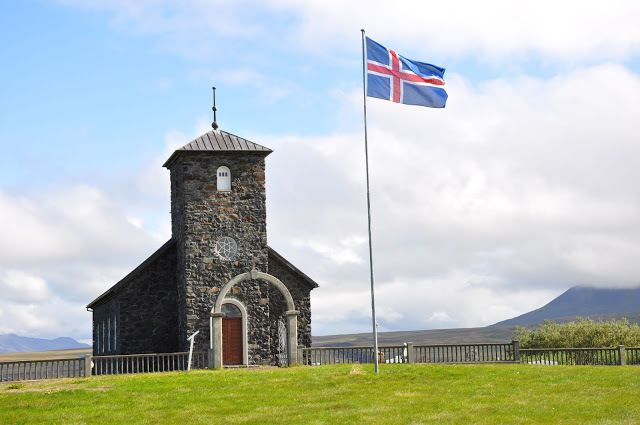 Much of the Icelandic history (the sagas) is somewhat inaccessible for Americans. We just can’t relate. However, Erik the Red and Leif Ericsson are something we understand. This was Erik’s homestead. You can still see the footprint of the home on the side of the hill. 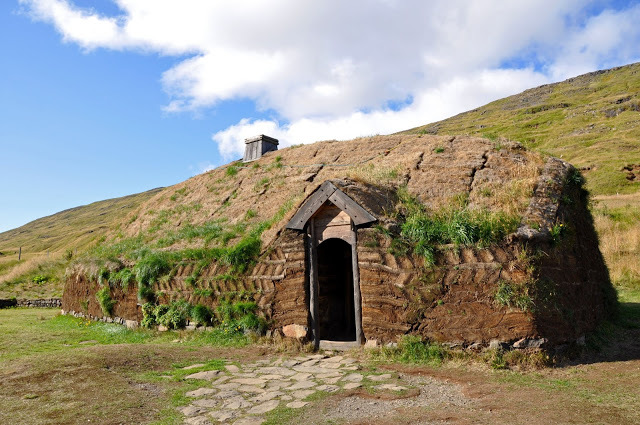 However, they have also built a recreation and employ re-enactors to create what life was like during the times of Erik the Red. We thought this could be cheesy, but it was rather impressive and authentically presented. As an added bonus, about 10 minutes back down Route 60 towards Route 1 is the farm of Erpsstadir – which makes handcrafted ice cream in to go cups. We bought a cup of delicious chocolate ice cream and hit the road back to Reykjavik. For a capital city, Reykjavik is still pretty small. For a European capital, it is downright manageable. Last year, we drove into Paris and it was a nightmare. We headed right into Reykjavik, found our hotel, the CenterHotel Klopp, on Klapparstigur Street. We actually found a parking spot right on the street in front of the hotel. The CenterHotel Klopp is a new, modern hotel right in the heart of the action in Reykjavik. Our room was on a high floor (3), but on the street. We did get some street noise on Friday and Saturday nights, but we had earplugs, so it really wasn’t a problem for us. In the afternoon we went out for a brief walk down Laugavegur (the shopping street) to get oriented to the city. For dinner, we had really had our fill of lamb and fish and other traditional Icelandic delicies. And, frankly, the paprika spice that Icelanders are in love with really didn’t satisfy our need for “spice.” For dinner, we decided to head to Austur India fjelagid. We’d heard it rumored that all the celebrities who come to Iceland dine here. Being minor celebrities ourselves, we decided to give it a shot. We were glad we did. Austur India serves up tasty and spicey dishes that resemble classic dishes, but have a contemporary flair. The cuisine here is not exactly as you’d find it in Britain or the U.S. If you are the kind of person who has that one Indian dish you love (and only that one dish), you might be disappointed. However, if you enjoy the cuisine of India, you’ll probably love it as much as we did. We very much enjoyed the Prawn Pollichithu appetizer, which was quite delicious. However, the Murgh Makhanwala main course was out of this world (very similar to chicken tikka masala). Overall, it was bit on the expensive side, but was definitely worth it. After dinner, we wanted to find a lounge-type place for a drink. We’d heard good things about the bar at the Radisson Blu 1919 Hotel. At the 1919 bar, we were able to try the Icelandic National Drink – Brennivin (called “Black Death”). It’s a schnapps made from potatoes and flavored with caraway. This drink definitely has some punch to it, but failed to live up to the “Black Death” name – it’s more bark than bite. Tomorrow is our last day with the car, including the Golden Circle and the Blue Lagoon.